Microdermabrasion is strictly a non-surgical operation. This treatment, compared to medical dermabrasion, allows to perform a delicate skin exfoliation but at the same time a deep and customized exfoliation, thanks to the use of interchangeable diamond tips with different coarseness which work at microscopic level. Using the microdermabrasion machines it is possible to improve skin irregularities, providing a cleaner and smother appearance: the small particles on the epidermis are rubbed to remove the irregular and thickened outer layer. Thanks to the Dermopeel, microdermoabrasion device developed and manufactured by Panestetic, you will be equipped with a powerful device, used by many beauty centers and clinics. 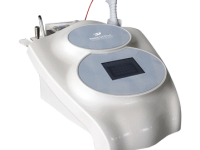 Dermopeel is a microdermabrasion device which uses diamond tips, which with a light abrasive action on the skin, remove dead cells and stimulate the production of collagen and elastin in order to keep the skin always young, fresh and clean. Dermopeel is equipped with a vacuum hand piece which speeds up the operation and optimizes the results, accelerating the cellular renewal. 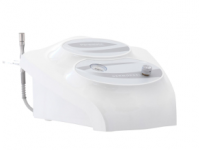 The Panestetic microdermabrasion machine removes body stretch marks, prepares the skin for subsequent cosmetic treatments and can provide an excellent peeling treatment. This tool is very effective also in presence of spots, scars, acne marks, wrinkles and other skin imperfections. Request more information through the contact form. Our team will answer your questions regarding this facial microdermabrasion device designed to take care of your customer’s skin.